University officials told KCOY that because of the drought more mountain lions are coming down from the hills to find water. Mountain lion attacks on humans are rare. 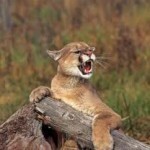 There have been only 16 verified mountain lion attacks on humans in California since 1890, six of them fatal. If you come into contact with a mountain lion, back away slowly and try to appear large by raising your arms and make loud noises, Fish and Game officials say. I’ve also spotted a few cougars around town… mostly near the bars.